As I write this tonight, mother nature is taunting me. Overhead there is a total lunar eclipse in progress and I’m missing it because it’s completely overcast and raining. Such is life. Lunar eclipses are fairly common, happening a couple times a year on average. But this one is different. It just so happens that this morning, December 21, is the beginning of winter solstice. A pure coincidence, but it means that the Moon will be at its maximum height in the sky to provide superb viewing of the eclipse. The last time that happened was in 1638. 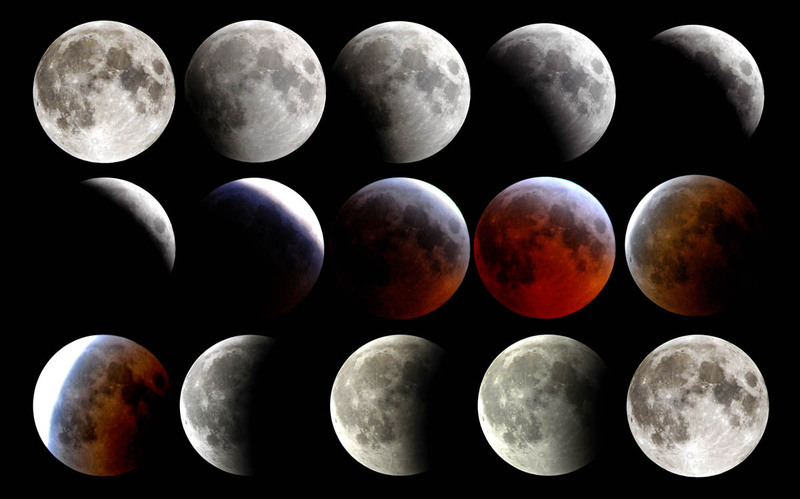 The stages of a total lunar eclipse. A lunar eclipse occurs when the Earth passes directly between the Sun and Moon, blocking the Sun’s light and casting a shadow on the Moon. Because the Moon is opposite the Sun, the Moon will always be full the night of a lunar eclipse. As the Moon progresses into the Earth’s shadow, it changes color from gray to orange or even red. This is because even though the Moon is in shadow, sunlight can still reach it indirectly by refracting through Earth’s atmosphere. Since our atmosphere filters out blue-colored light (that’s why the sky is blue), only light from the red/orange portion of the spectrum passes through and actually makes it to the Moon and this light is what we see during a total lunar eclipse. If the atmosphere has more particles in it, say from recent volcanic activity, for example, the Moon will take on a deeper shade of red. Eclipses are said to be either umbral or penumbral. The word “umbra” is from the Latin word for “shadow” and this is what we call a total eclipse. Penumbra is Latin for “almost shadow” and this refers to a partial eclipse. The next opportunity we will have to see a total lunar eclipse here in the U.S. will coincide with a somewhat more dubious date—Tax Day—April 15, 2014. 1) True or false: A lunar eclipse occurs when the Moon passes between the Earth and the Sun. 2) During a total lunar eclipse the moon will ________________. a) disappear b) turn orange c) turn blue d) cast its shadow on the Earth. 3) True or false: The moon will appear redder if there has been recent volcanic activity. 4) Regarding winter solstice, which of the following is not true? a) It occurs when the Earth’s axis is tilted farthest away from the sun. b) It signifies the first day of winter in the U.S. c) It occurs on the shortest day and longest night d) It occurs when the Earth is farthest from the Sun. 5) Umbra is Latin for ________.